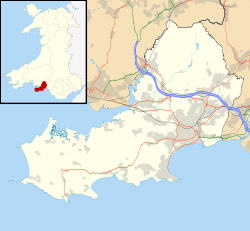 Swansea is a city and county in Wales, UK. It is the second largest city in Wales. It is in the West of Wales, on the coast. It has a temperate oceanic climate, with the most rain of all British cities. About 240,000 people live in Swansea. A view of the Swansea coastline, near the city centre.